This blog has been put together to help answer questions about and share tips for making the Red Plague Remedy. Please read through the topics covered in the tabs at the top of this blog before asking questions. Please use the tabs at the top of this blog to find info that will help make the tincture making process for this remedy smoother and easier for you. 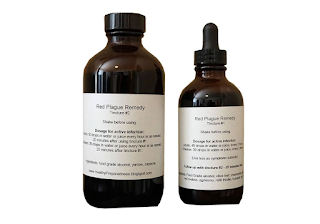 Here's the written story (and recipe) behind the formation of this remedy. Here's the audio recording where I talk about how it came to be. Here's where it can be purchased if you have no interest in making it yourself. This is a two-part tincture. You use some of the remedy #1 and 20 minutes later you give some of tincture #2. One set is enough for one adult for approx. 1 1/2 weeks. One set it enough for two children ages 5 and under for 1 1/2 weeks. This remedy will last 20+ years to indefinitely. Please read through the written story / recipe to know when and how to use the remedy. There's a tab at the top of this blog titled "Cutting Down the Recipe" that answers that question. Claudia, Thank you so much for your efforts. As I listened to your call, specifically about how people were saying that this could be a deception, I prayed for myself to know if this is something from our Heavenly Father. Instantly, the Spirit engulfed me with a resounding, yes! I know this is something I need to acquire for my family. I look forward to getting some of this very soon! Valuable information in your blog and I really appreciate your work and keep it up dude I really very informative blog about the gewürzmischung well done. I search many blog about the vegetable plants but did not get many specific detail about the this topic but your blog have allot of information about my topic which I always searching. my sister had great results with it for anything respiratory.